Apart from the league programme, I learn that Mid Cheshire is to be placed in possession of a beautiful trophy for the purpose of a club competition, and to benefit the Towns Victoria Infirmary. The arrangements are to be entrusted to Mr Tom Cowley, and a new charity organisation has been formed, chiefly of the old patriotic committee, with a reprosentative from each Mid Cheshire club, I am not at liberty of the particulars at the moment. 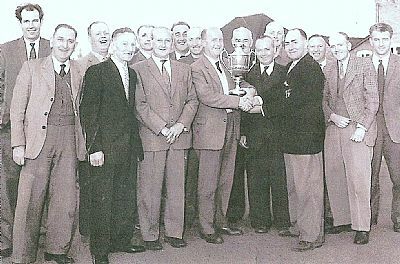 The Littler cup was donated to the Mid Cheshire bowls association in 1919 by James Littler of the well known timber merchants in Northwich. The cup was to be played for by affiliated clubs, who would be handicapped and all proceeds from the competition were to be given to charity. The first winners of the competition were Verdin Park BC, James Littler's two sons playing for the winning side. FINAL : Played at the Gladstone club, Northwich. There was a splendid attendance at the Gladstone club, perhaps accounted for by the fact that the games were held back until 4:30pm to permit football enthusiasts a chance of seeing them. The venture turned out disasterous from a playing point, because the last four games were played in almost darkness. The cup and medals were presented to the winners at the conclusion by the donar, Mr James Littler in the billiard room at the club and almost without exception the players answered the call for their medals. * 18 a side in 1921. From the Northwich Guardian, by Thumb Bias. The final of the Littler cup, between Northwich and Rudheath will take place at the Gladstone club tomorrow Saturday. The game will commence at 5pm prompt, and the cup will be presented to the winners by Councillor J.O. Gleave, chairman of the club. Jim harper the popular Heathen will captain his side, while Arthur littler will be in charge of Northwich. Mr Tom Hodkinson, the league chairman will officiate as referee assisted by Messrs George Roden and W. Pickstock as measurers. The rain fell heavily and hurried the players to the pavilion on several occasions, and Bill Naylor in particular suffered mostly as a result in his game with Harry Stubbs, but like the sticker that he is, ran to 19 from 14-18 in arrears, and finally won 21-19. Jim Harper made a big effort at 10-9 in arrears to catch up with Jesse Winnington, who had sent along some fine woods on round peg marks, and so well did he play that 16-19 next went up before, the Northwich secretary secured the winning double. Edgar Peover made a run of 15 points before sacrificing the jack to Bill Gandy, and continuing to play well, left the green a good winner at 21-7. At this stage Rudheath were leading by 54 points and although this was greatly reduced by the fine card of Arthur Littler at 21-9, the match was all over bar the shouting, and the Rudheath supporters were more useful at this part of the buisness. There was an excellent attendance of enthusiasts at Rudheath on Saturday, when Northwich and Lostock Gralam met to decide the final of this years competition for the James Littler Charity cup. With the exception of one or two league games, unplayed on the original dates, owing to cup ties, the bowling season in Mid Cheshire was concluded on Saturday with the final of the Littler Cup at the Bulls Head at Davenham. The match was timed to commence at 5:30pm owing to football matches being played in the afternoon, a decision which proved popular by the large crowd gathered around the green. The contestants were Northwich and Rudheath, who won the cup three years ago, on which occasion they defeated Northwich at the Gladstone club. The league chairman, Mr Tom Hodkinson presented the cup to the winning team, and congratulated both clubs on the excellent feeling exhibited during the match, and hoped the proceeds would be in advance of the previous years. Mr kirkham and Mr Goodier, the respective captains, returned thanks. Davenham Rec B created one of the biggest surprises of the season by beating Northwich bowling club B in the final of the Littler cup, in front of a great crowd at the Farmers arms, Rudheath. Saturday 26th August, played at Verdin Park, Northwich. Barnton Civil defence triumphed in the Littler cup final on Saturday before a record crowd. It was the cups jubilee year and an additional £100 will be presented to the Northwich Victoria Infirmary to mark the occassion. Barnton secured a 23 point victory over Rudheath. The cup was presented by Mr J.A Hodkinson, chairman of the Northwich Urban council. Played at Lostock Alkali on Saturday 29th July. Dropping only one chalk in the last four blocks, Farmers Arms A overtook Owley wood B to win the Littler charity bowls cup, by the terrific margin of six chalks at Saturday evenings final at Lostock. Farmers thus captured the trophy for the first time since 1952. 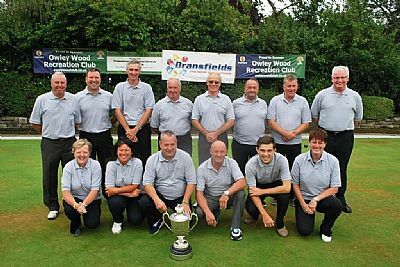 Owley Wood started with a handicap advantage of 55 and held their ground early on, thanks to a fine 21-5 victory by Bill Storey over off colour John Goolding. But Farmers made big inroads into the Weaverham team's lead when they won games number 5,6,7,8 three of them by wide margins. Then came the last four blocks and three more winners, with Alan Lewis to Owley woods only other individual winner, Ron Gurney, by 21-20. The trophy was presented by Tom Curbishley of knutsford. Referee was Fred Johnson, vice chairman of the Mid Cheshire association. Played at the Farmers Arms, Rudheath on Friday 8th August, Owley wood C beat Moulton RBL A 365-305, the Weaverham side were off 115 while thereopponents were off 150. The Littler cup was presented by northwich Town councillor Mr Ron Carey. Northwich Guardian, thursday 13th August. After the disappointment of losing the 1969 Littler charity cup final, Moulton RBL won the trophy at Owley Wood on Friday, when they defeated Meadowbank B by 21 chalks. The referee for the evening was Jack Jolley and the trophy was presented by former Winsford UDC chairman John Jackson. Referee for the final was Percy Wilkes, and the trophy was presented by the President of Winsford Liberal club, Fred Dodd. Played at the Beech Tree, Barnton on Friday 27th july at 6:15pm. Cup presented by Alf Harrison, President. Referee Mr john Maylor of Norley. Referee, Mr Bernard Morgan of Crewe. Cup presented by Mr K Moran, past president. Northwich Guardian, Wednesday 18th July. Comberbach took the Littler cup for the first time in their history with a 19 shot win over Hazel Pear. 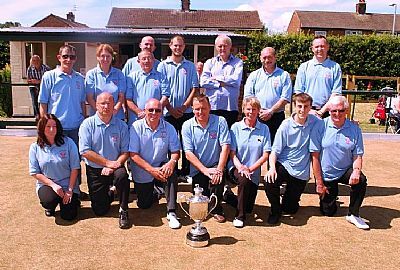 the winners began the final at Moulton RBL on Friday with a plus 18 handicap and steady bowling throughout gave them the trophy. There was some outstanding stuff played in front of the large crowd, with Mark winnington and Steve Brittleton keeping the losing side in it with 21-11 victories. At number 11 for Hazel Pear, alan Chantler tried to keep their hopes alive with a 21-14 win but it wasn't enough. for Comberbach, John Kellett won 21-8 and son Stuart wasn't to be outdone as he had a 21-15 success. Andy Hamman and Matt Thurwell won their games 21-16 to keep Hazel Pear at bay. Played at the Farmers Arms, Rudheath on Monday 8th September. Referee, Mr M Harding, measurers Mr V Slater & Mr D Warburton. From the Centurian, Friday 18th July. A large crowd turned out at Moulton RBL last Sunday to watch the 89th Littler cup final between Wharton Cons A and Winnington Park A. The Wharton club who last won the trophy in 2005 had to give Winnington, who were last winners in 1990, 32 points start and they powered to a 28 point victory. Cons started with four winners in the first four games clawing back twenty points. In the middle four the games were shared and the points shared leaving Winnington leading by twelve chalks with the last four to play. Cons posted all four winners to overpower the Winnington four by 40 points and thus gain match victory. The competition was sponsored by Diamond metal finishing Co Ltd and the trophy was presented to the winning captain Glynn Cookson by Ted pendleton the company managing director. Wharton Cons have won the competition on eleven occasions and Winnington Park on seven occasions since the first running in 1919. Played at Wharton Cons BC on Sunday 19th July at 2:30pm. Winning team £250, runners up £140. Castle Private A stormed to success in the Mid Cheshire bowling associations Littler Cup. They overcome a 48 chalk start to defeat underdogs Rudheath Private B 250-206 at the Beech Tree in Barnton. Ten of the twelve up's went Castle's way, with Chris McDonald the best winner with a 21-2 card against Kelvin Hardy. 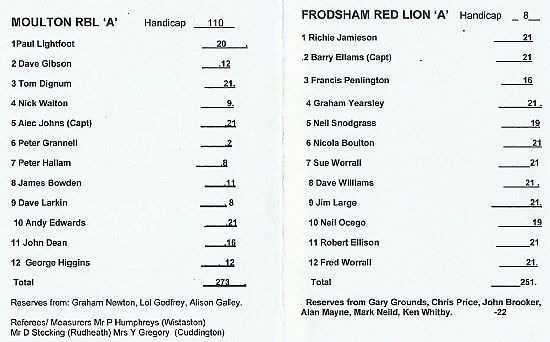 Dave Buckley and Dave Freeborough were Rudheath's two victors, while Phil Gandy, Ian Kennerley, Clive Nelson and Tom Lowe pushed their Private opponents to the wire. Northwich Guardian, Wednesday 22nd August. Dave Morris hailed his teams will to win after they captured again the Littler Cup. Rudheath Private C, winners in 2010, recovered from a slow start to defeat Cuddington in Thursday's final at Wharton Cons. Rudheath lost the first two head to heads when Morris and Dave Wilding were on the green, but were victors eight of the next nine to clinch victory. In the end, their 10 chalk handicap advantage didn't matter. Bowlers from Spinner & Bergamot made history at the weekend when they won the Littler Cup for the first time. After knocking out Mid Cheshire bowling association premier league teams Wharton Cons B and Castle Private A in previous rounds, they completed a hat trick of surprise successes against neighbours Comberbach A. The margin of victory on Sunday at Owley Wood, where the underdogs started with a 71 chalk handicap advantage, was 15 points. ‘Were all on a big high still,’ said Spinner captain Tamsin Birkett on Monday. ‘Most of our players hadn’t taken part in a final before, which makes our triumph that little bit more memorable. The trophy will take pride of place now back at the pub, so hopefully lots of people will notice and ask why it’s there’. Comberbach, hoping for a third win since the turn of the century, returned ten winners in windy conditions at the Weaverham venue. However victories for Dave Gallimore, against last year’s Guardian Cup winner and Comberbach captain Matt Thurwell and Lisa Kerford tipped the aggregate score Spinners way. Peter Thorp made it to 20, while Keith Birkett and Nigel Cwiklinski both lost to 19. Tamsin said,’ it was a real team effort, just as it had been to get through to the final in the first place. We thought we stood a chance, but of course you can never be too confident against an opponent from the top division. We were aware all the way through what we had to do, and it was a relief to make it to the finish line. It was an important moment for the pub, particularly (Landlords) Rob and Anita (Southerton) who have been big supporters of bowls. They’ve paid to improve the facilities, including lights around the green, so it was a way of saying thanks to them’. 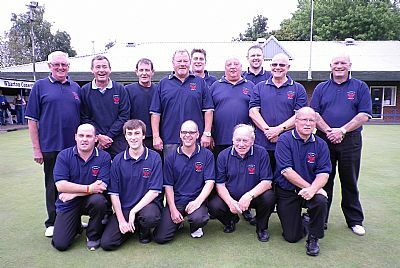 Wharton Cons A captured an eighth Mid Cheshire bowling Association Littler cup title after beating old foes Castle Private A in last Mondays final at Davenham, the Winsford outfit returned eight winners in a 231-197 success.